List of common conditions and terms useful for you to answer questions rising in your mind. The word amputation generally means the severing or removal of a limb or part of a limb. 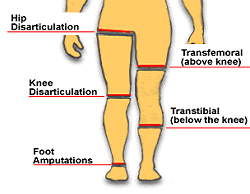 It is important to differentiate between amputation as a result of a surgical procedure and amputation due to a traumatic accident. Amputation as a surgical procedure is usually only carried out as a last resort to save the life of a patient or when a limb is so severely diseased that no recovery is possible. Some of the reasons that make a surgical amputation necessary may be: accidents, infections, gangrene or cancer. Emergency amputations are sometimes carried out at the scene of accidents by emergency medical teams when the victims are trapped in such a way that there is no other way to save their lives. There are still a number of amputations as a punishment for certain crimes. AFOs are designed to provide support, proper joint alignment to the foot and ankle, assist or substitute for muscle weakness, and protect the foot and lower limb. This type of orthoses typically comes in either metal or plastic and come in rigid, semi-rigid and articulated. Achilles Tendonitis is a condition of irritation and inflammation of the large tendon in the back of the ankle. Although it is the largest tendon in the body, it is also the weakest and most prone to injury. It is also the most injury-prone due to its limited blood supply and the enormous stress placed upon it. The condition usually occurs in middle-aged athletes. Achilles tendonitis can worsen if not treated properly, so address the problem promptly as it will not go away on its own! If you are suffering from Achilles Tendonitis we can help. Come in for a free fitting and our qualified staff will advise on products to help relieve your Achilles tendonitis pain. Proper footwear help you walk properly and correct your balance can also help treat Achilles Tendonitis symptoms. Ankle pain refers to any pain or discomfort in the ankles that may be caused by a variety of issues, from an injury to a medical condition. Rest, Ice, Compression and Elevation. See a podiatrist to rule out a fracture or a ligament tear. Immediate treatment often results in complete healing and a return to normal function. For a recent injury, we recommend cold therapy, the Aircast ankle walker, and gel insoles. For ongoing, occasional ankle pain, we highly recommend arch supports or the ankle supports. The high ankle shoes are designed to treat ankle varus, ankle varus is a condition where the ankles roll out, diminishing the stability and overall alignment of the body. When you first begin to notice discomfort or pain in the area, you can treat yourself with rest, ice, compression, and elevation (RICE). One of the most successful, and practical treatments recommended by doctors are orthotic devices, sometimes referred to as arch supports. Orthotics take various forms and are constructed of various materials, usually best recommended by your doctor to address the severity of your problem. All orthotic devices serve to improve foot function and minimize stress forces that could ultimately arch pain. Follow up with your Doctor until you are better. They should advise on a plan for a gradual return to normal activities, once the pain is reduced and muscle strength and flexibility are restored. Athlete’s foot is a skin infection caused by a fungus, usually occurring between the toes or on the soles of the feet. The signs of athlete’s foot can include dry skin, itching, scaling, and blisters. Blisters often lead to cracking of the skin. When blisters break, small raw areas of tissue are exposed, causing pain and swelling. Daily washing of the feet with soap and water or quality anti-fungal soap; drying carefully, especially between the toes; and changing shoes and socks regularly to decrease moisture. Reduce perspiration by using foot powder in shoes, and wear shoes of leather or canvas, or perhaps nylon mesh, which allow good air circulation. Avoid walking barefoot and use shower shoes whenever possible. It is also called Erb’s Palsy or “Waiter’s tip” is an injury to the brachial plexus resulting in weakness or paralysis of the upper extremity. The patient often has an arm that hangs limp and is internally rotated at the shoulder. The elbow is extended but flexion of the wrist and fingers are preserved with the palm potentially facing up. This injury is common with difficult births (2-3 per 1000 births) symptoms will sometimes resolve with immobilization however, if no improvement is seen surgery is indicated. Although the most common type of back pain comes from straining the bands of muscles surrounding the spine, it is not at all uncommon for back pain to be traced back to foot problems such as severe pronation. When your weight is improperly distributed across the feet your walking gait becomes uneven. This places greater strain on your ankles, knees, and even your lower back which over time may result in painful repetitive stress injuries. Wearing supportive shoes, especially when you exercise, or fitting your shoes with arch support inserts can be highly effective in preventing lower back pain and even relieving some lower back pain in its earliest stages. For chronic or acute back pain footwear corrections alone will probably not provide adequate back pain relief. The use of a back support or back brace is recommended (and of course for persistent or severe back pain the value of a doctor’s diagnosis and treatment cannot be over-stated). Back supports and back braces allow for more ergonomic heavy lifting on the job, reduce the incidence of muscle spasms, and alleviate many types of back pain. The metatarsal area is the region where the toes join the rest of the foot, an area often subjected to added pressure because of body weight., Metatarsalgia (commonly referred to as ball-of-foot pain)can occur in the region between the arch and the toes. Pain results when the balance between the metatarsal bones (long foot bones) is thrown off. Bunions are a very common condition that affects women significantly more than men due to poorly fitted footwear. A bunion is a bony protrusion that can occur at the base of the big toe joint. This bony lump can cause friction and pain when wearing shoes. Bunions are frequently associated with inflammation of the bursa, a fluid-filled sac that helps cushion the bones of the foot. Another type of bunion, called a Tailor’s bunion or bunionette, forms on the outside of the foot on or at the base of the little toe joint. Smaller than a typical bunion, it is caused when the little toe is pressed in towards the big toe. With continued displacement of the big toe towards the smaller toes, a bunion can lead to the big toe resting under or over the second toe (a common condition called overlapping toes). It also can lead to a toe muscle deformity called hammer toes. Wear a special bunion pad such as a bunion shield, gel sleeve, or gel toe cap to restore comfortable mobility. You can prevent a small bunion from becoming painful by wearing well-fitting shoes that have a roomy toebox and supplementing them with arch supports or orthotic insoles to ensure that your weight is evenly distributed across your foot. Gel toe separators promote comfortable toe spacing and can provide relief when a person’s bunion has progressed to the point where their big toe sits above or below the toe beside it. You may not notice the problem at all during the day, though certain activities – such as writing, typing – can bring on symptoms. Sometimes the condition can be mistaken for something else. For example, pressure on nerves in the neck due to disc problems or arthritis can cause similar symptoms. A nerve conduction test may help if there’s any doubt about the diagnosis. If there’s a particular cause, like an underactive thyroid or arthritis, treating that condition may help. Other treatment will depend on how severe the nerve compression is. It’s important to get help quickly if your hand muscles are weak. Wearing a resting splint can help prevent the symptoms occurring at night, or a working splint can be useful if your symptoms are brought on by particular activities. Splint prevents your wrist from bending thus preventing compressing the nerve. Your doctor can advise on where you can be fitted with a splint. To reduce inflammation, your doctor can give you a steroid injection into your carpal tunnel. The injection may be uncomfortable, but the effects can last for weeks or months. When the symptoms are severe and do not improve with above measures then surgery may be needed. A carpal tunnel release is the simple procedure involving releasing the ligament that forms the top of the tunnel on the palm side of the hand, therefore easing the pressure on the nerve. In most cases of Charcot foot, only minor trauma causes the foot arch to collapse, so in order to prevent this possible outcome, it’s important to spend time examining your feet and wearing shoes that offer both comfort and support. People with Charcot foot or diabetes wear good, supportive shoes with a soft insole of micro cellular rubber to absorb shock. Extra depth oxfords are also a good choice for people suffering from Charcot foot. The patient can play a vital role in preventing Charcot foot and its complications by following these measures: Diabetes patients should keep blood sugar levels under control. This has been shown to reduce the progression of nerve damage in the feet. Get regular check-ups from a foot and ankle surgeon. Check both feet every day and see a surgeon immediately if there are signs of Charcot foot. Be careful to avoid injury, such as bumping the foot or overdoing an exercise program. Follow the surgeon’s instructions for long-term treatment to prevent recurrences, ulcers and amputation. It is a term used to describe a group of disorders that affect movement control. It can be caused by injury to the brain before, during, or after birth. Cerebral palsy may be acquired after birth secondary to an accident, head injury or infections such as bacterial meningitis or viral encephalitis. Symptoms vary with each case. Diabetes disrupts the vascular system, affecting many areas of the body, such as the eyes, kidneys, legs, and feet. Indeed people with diabetes should pay special attention to their feet. Did you know that diabetic foot wounds are the leading cause of hospitalization for diabetics? Diabetic feet are vulnerable to the same foot problems as other feet: blisters, bunions, calluses, corns, athlete’s foot and other common foot conditions. Diabetic feet are simply less able to meet the challenge of maintaining healthy feet when confronted with external damage and environmental stresses. It is important to remember that severe and disabling diabetic foot problems are not inevitable. Even if you have suffered from diabetic foot complications in the past, controlling your blood sugar level, wearing diabetic shoes and socks at all times, using diabetic foot care products as needed, and practicing proper diabetic foot care techniques on a daily basis can improve and preserve the health of your diabetic feet. Diabetic foot problems are not inevitable and healthy diabetic feet are an achievable goal. There are two basic principles to a successful diabetic foot care plan: attention and prevention. Even for those who suffer from diabetic neuropathy or poor circulation, performing daily self-exams on your diabetic feet and taking immediate action at the first sign of diabetic foot complication symptoms can dramatically decrease your risk of developing diabetic foot ulcers and diabetic foot infections. Wearing diabetic shoes and socks at all times and using diabetic foot care products such as diabetic foot cream as needed, can help prevent diabetic foot injuries before they occur. To maintain healthy diabetic feet, do these things every day. Inspect your feet using our diabetic foot self-examination guidelines. Wash your feet with warm water and mild soap. Pat your feet dry rather than rubbing. Make sure your entire foot including the skin between your toes is dry. If you have dry skin, apply a diabetic foot lotion or cream to the top and bottom of each foot. Pay special attention to heels which can become dry and cracked. Do not apply lotion or cream to the skin between the toes. If your feet tend to sweat, use diabetic foot powder to prevent bacterial growth. Wear diabetic shoes and diabetic socks at all times, even when walking around your own home. Look inside your shoes for pebbles, sand, and other skin irritants before putting them on. Change your shoes and socks at least twice a day and more frequently if your feet tend to perspire. This gives shoes a chance to air out and prevents your feet from becoming overly accustomed to a single shoe’s sole. The first thing to remember when self-examining diabetic feet is to be thorough. Examine the top, bottom, and sides of each foot as well as the heel and in between the toes. If you have trouble seeing the bottoms of your feet, diabetic foot mirrors are available to assist you. If you notice the following diabetic foot problems administer first aid as needed; then contact your doctor. Cracking skin between the toes. This is often a sign of athlete’s foot. Usually blisters are caused by friction, but they can also be the result of burns. Do not puncture a blister! Apply ointment and a bandage to the affected area. Small Cuts. Rinse the wound. Apply antibacterial cream to the affected area and cover with gauze and hypoallergenic tape. Dry Heels. This can lead to skin cracking which can in turn lead to diabetic foot ulcers. Apply a moisturizing diabetic foot cream or lotion. If cracks have already appeared contact your doctor immediately. Foot Swelling. Some diabetics use compression socks or hosieryto reduce diabetic foot swelling. This is not the right choice for all diabetic patients, so be sure to consult your doctor before beginning self-treatment. If you have no open foot sores, very mild calluses can be treated using the Personal Pumi Baron damp skin. Moderate and severe calluses must be trimmed by a podiatrist. Sores and diabetic foot ulcers.These most often occur on the ball of the foot or on the bottom of the big toe. When they occur on the sides of the foot it is usually a sign that your shoes are the wrong size. See a podiatrist for treatment immediately. If left untreated, ulcers in particular, can lead to gangrene and amputation. Changes in the color of skin on the feet. Changes in the temperature of the skin. Just because you’re diabetic, it doesn’t mean you only have a few options when it comes to selecting fashionable diabetic shoes. At orthoshoes.com, we offer a grand selection of diabetic shoes that are not only functional and comfortable, but stylish. In addition to providing wound care and postoperative shoes for diabetics, we offer diabetic dress shoes, work shoes, boots, and other diabetic footwear that can help diabetics lead full and active lives without fearing for their feet. Proper footwear is an important part of an overall treatment program for people with diabetes, even for those in the earliest stages of the disease. If there is any evidence of neuropathy or lack of sensation, wearing the right footwear is crucial. By working with their physician and a footwear professional, such as a certified pedorthist, many patients can prevent serious diabetic foot complications. Accommodate, Stabilize and Support Deformities. 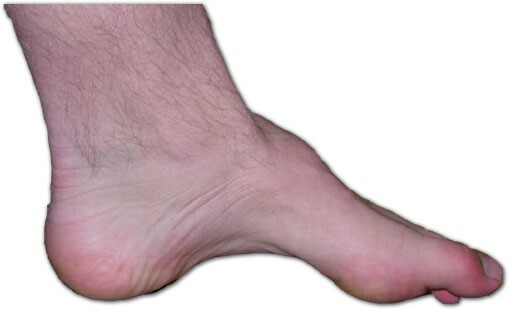 Deformities resulting from conditions such as Charcot-Marie-Tooth, fat pad atrophy, hammertoes and amputations must be accommodated. Many deformities need to be stabilized to relieve pain and avoid further destruction. In addition, some deformities may need to be controlled or supported to decrease progression of the deformity. If you are in the early stages of diabetes, and have no history of foot problems or any loss of sensation, any properly fitting shoe made of soft materials with a shock absorbing sole may be all that you need. It is also important for patients to learn how to select the right type of shoe in the right size, so that future problems can be prevented. The excessive pressure and friction from the wrong kind of shoes or from poorly fitting shoes can lead to blisters, calluses and foot ulcers, not only in the insensitive foot, but also in feet with no evidence of neuropathy. It is highly recommended that shoe fitting for patients with any loss of sensation be done by a professionally trained person who has vast experience. In achieving proper shoe fit, both the shape and size of the shoe must be considered. You should try to match the shape of the shoe to the shape of your foot. This means that you should be sure your shoes have adequate room in the toe area, over the instep, and across the ball of the foot, and there should be a snug fit around the heel. When considering your correct shoe size, remember that the width is just as important as the length. The proper shoe size is the one where the widest part of the foot, which lies across the foot at the base of the toes, is in the widest part of the shoe. There should also be 3/8 to 1/2 inch between the end of the shoe and the longest toe. In addition, a shoe with laces is recommended to provide the adjustability needed for any swelling or other deformities and to allow the shoe to be fit properly without any danger of slipping off. Immediately following surgery or ulcer treatment, some type of shoe may be necessary before a regular shoe can be worn. These include custom sandals (open toe), heat-moldable healing shoes (closed toe), and postoperative shoes. Visit our selection of wound care shoes. The extra-depth shoe is the basis for most footwear prescriptions. It is generally an oxford-type or athletic shoe with an additional 1/4- to 1/2-inch of depth throughout the shoe, allowing extra volume to accommodate any needed inserts or orthoses, as well as deformities commonly associated with a diabetic foot. Extra-depth shoes also tend to be light in weight, have shock-absorbing soles, and come in a wide range of shapes and sizes to accommodate virtually any foot. This involves modifying the outside of the shoe in some way, such as modifying the shape of the sole or adding shock-absorbing or stabilizing materials. An orthosis is a removable insole which provides pressure relief and shock absorption. Both pre-made and custom-made orthoses or inserts are commonly prescribed for patients with diabetes, including a special “total contact orthosis,” which is made from a model of your foot and offers a high level of comfort and pressure relief.. Whether a pre-made orthotic, a custom orthotic, or a prescribed orthotic is the right choice for you will depend on the severity of your foot condition. When extremely severe deformities are present, a custom-made shoe can be constructed from a cast or model of the patient’s foot. These cases are rare. With extensive modifications of in-depth shoes, even the most severe deformities can usually be accommodated. Hope Center takes good care of your feet and make sure you have the right foot wear. Whether you have been recently diagnosed or have had diabetes for many years, proper footwear can help prevent serious foot problems. Be sure to talk to your physician about the type of shoes, modifications and orthoses that are right for you. It is an inflammation or damage to the area of an epicondyle of bone. An epocondyle is a projection of bone above condyle (a rounded prominence at the end of a bone usually where the bone connects to another bone) where ligament and tendons are attached. Flat feet can be present at birth, an early age, or can be hereditary. All too often, flat feet develop as a result of foot abuse, including wearing shoes that do not provide proper arch supports, standing or walking for long periods of time in high heels, or aging or heavy strain place on the feet. When the arch is fully collapsed or rolls inward, you have flat feet, meaning you are missing crucial arch support. People with flat fleet must therefore shift pressure from walking to other parts of the foot, which can cause intense pain. If left untreated, flat feet not only cause pain, but can lead to other more serious foot and lower body joint problems. Flat feet can be treated with supportive shoes and orthotics, for the shoes that support the arch. Footwear with a firm heel counter is recommended for extra support and stability. 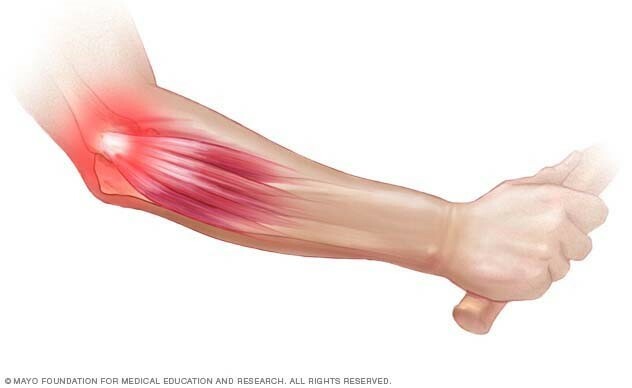 Common symptoms include: pain over the inside of the elbow, pain when lifting, or pain when flexing and supinating (turning your palm upward). Heel pain is a very common foot pain and it can be caused by several conditions or stressors. The heel bone is the largest bone in the foot and the first to hit the ground while moving, inviting a lot of stress to the heel area. Heel pain is generally due to an incorrect walking gait that puts too much stress on the heel bone and the soft tissues attached to it. Most common in active people 40 years old and older, heel pain oftentimes develops when there is an irritation in the ligament that runs along the bottom of the foot to the heel (plantar fascia). This can cause heel pain to occur in the front, back or bottom of the heel. Most people experience heel pain due to Plantar Fasciitis, Achilles Tendonitis, heel spurs or an injury. Children’s heel pain has different causes than adult heel pain. If you’re interested in learning about children’s heel pain, please visit our Sever’s disease page. Heel pain is usually caused by Plantar Fasciitis, which is inflammation and strain to the plantar fascia (the ligament that runs from the toe joints to the heel). Achilles Tendonitis is inflammation of the Achilles Tendon, which creates pain at the back of the heel. A heel spur is an abnormal bone growth that occurs on the heel bone where an injury or inflammation takes place. Heel pain could also occur from an injury, feet repeatedly putting pressure on hard surfaces or being overweight. Orthopedic shoes with a shock-absorbing sole will protect the heel bone against injuries from hard surfaces. If you pronate incorrectly, wear arch supporting insoles and supportive shoes to correct your gait, reducing stress on your plantar fascia. Properly stretch your calves, Achilles Tendon and plantar fascia ligament in your feet to reduce chances of inflammation. Prevent and treat heel pain by wearing supportive and cushioning shoes and insoles. Insoles can be worn to support and cushion the feet, while preventing incorrect pronation which can eventually cause pain. Heel lifts will reduce the strain on the Achilles Tendon and heel cushions will soften the step for aching heels. After you feel heel pain, rest the injured foot, and use ice or anti-inflammatory medications to reduce pain and swelling. Use our doctor-recommended products to support your arch and foot to reduce heel pain or use our wound care products to protect your heel from stressors. If you are experiencing heel pain, have your foot evaluated by a doctor to learn about the cause and treatment options appropriate for you. We offer a wide selection of foot and heel comfort products. For example, heel cradles and heel cups provide extra comfort and cushion to the heel, reducing the amount of shock and shear forces experienced from everyday activities. Visit us in store and get a free fitting and free digital foot assessment. Functional knee orthoses are designed to aid in the stability of the knee joint secondary to ligament injury, postoperative reconstruction, meniscus damage, and for preventative protection. These orthoses are designed to provide maximum stability to the knee joint. Injury to the ligaments of the knee cause unwanted motion between the femur and the tibia. If left untreated, this can create significant joint laxity, lead to degenerative joint changes and put the patient at risk for further injury and cause subsequent damage to the surrounding structures. Functional knee orthoses can be made by the patient’s measurements or by a custom model of the patient’s leg. Prosthetics is the term used for all aids, which replace missing limbs or body parts. They are employed whenever a physical deficit needs to be compensated for, after for example the amputation of a body part caused through accident (trauma), vascular diseases, diabetes, congenital disorders, cancer or degenerative tissue disease. Prosthetics have a very wide range of applications, from replacement fingers to artificial legs. They vary greatly in appearance and in use. What was in the past a simple peg-leg, is today a highly specialized and individually tailored high tech carbon fiber prosthetic leg, sometimes with the refinement of knee joint controlled by a micro-processor. There have also been remarkable developments in the field of arm prosthetics. Steel and leather prosthetics, which are operated by means of belts and muscle movement alone, are now being replaced by myoelectric devices, incorporating small battery driven motors to carry out hand functions. Naturally, there are still wood and leather prosthetics around, but these are becoming rarer. New low weight materials (i.e. carbon fiber) with better functionality or with a more lifelike and natural appearance (silicon cosmetic covers) have greatly improved conditions for prosthetic wearers. The level of amputation and needs and abilities of the patient are paramount in deciding which prosthesis is most suitable for each individual. Training in the care and use of the prosthesis by specially trained therapists is essential. The Hope Rehabilitation Center offers a full range of prosthetic/orthotic services. It is a recognized leader in improving the lives of people with disabilities through the use of the latest in prosthetic and orthotic technology. Hope’s modern facility is a key to providing best quality and superior patient care. We offer innovative technology and quality treatment combined with a professional “patient friendly” and respectful environment. Or patients and referring professionals continually comment to our staff that our facilities are the most professional, comfortable, and friendly they have ever visited. Such unique experiences are the essence of Hope Orthotic and Prosthetic Systems. Our facility is managed by dedicated practitioners/partners who have spent years obtaining a formal education in medicine, surgery and engineering and expanding their knowledge by regularly attending continuing education programs. We stress on intensive continuing education for the entire staff. We regularly conduct in-service lectures and demonstrations for our practitioners and other members of the rehabilitation team at our facilities or in clinic or hospital settings. In order for our referring physicians and patients we have 24-hour access to our staff. And true to our national tradition, neither snow nor rain deters us since most of our staff is equipped with at least one drive vehicle and also we have a mobile workshop unit. Our location is close to the most prestigious hospitals, rehabilitation centers, and nursing homes in its area. We are proud of our professional stature in the communities we serve and we have a close working relationship with our affiliating physicians, physical therapists, and rehabilitation team participants. New components, innovative techniques, creative designs, and advanced technologies are all part of the compassionate, goal-oriented treatment each patient receives at House of Orthotic & Prosthetic Excellence (HOPE). Prosthetics and orthotics combines knowledge and understanding of the human body with the application of forces and evaluation of mechanical components. Central to prosthetics and orthotics is the prosthetic and/or orthotic user and their psychological, social and cultural needs. Prosthetists and orthotics assess, diagnose, treat, and manage a broad range of problems associated in particular with the neuromuscular and musculoskeletal systems. They work collaboratively with other health-care professionals to provide integrated treatment. Poliomyelitis, commonly referred to as polio, is an incurable acute viral infection. If the virus enters the central nervous system, it can cause muscle weakness and flaccid paralysis to affected muscle groups. Spinal polio is most common, and often directly affects muscle groups in the feet and legs. One in every 200 persons infected with polio leads to irreversible paralysis (usually in the legs). Among those paralysed, 5%-10% die when their breathing muscles are immobilized by the virus. There is no cure for polio. Polio can only be prevented by immunization. A safe and effective vaccine exists – the oral polio vaccine (OPV). OPV is essential protection for children against polio. Given multiple times, it protects a child for life. Tremendous achievements have been made in the global fight against polio since 1988 when the World Health Assembly resolved to eradicate the disease. The number of polio cases worldwide has decreased by more than 99%, from more than 350,000 in 1988 to 223 cases in 2012. The number of endemic countries has decreased from over 125 in 1988 to just three – Afghanistan, Nigeria and Pakistan. Post-polio syndrome (PPS) can cause a wide range of symptoms which can have a serious impact on everyday life. Fatigue, muscle weakness and muscle and joint pain are just some symptoms that are experienced by polio suffers. Poliomyelitis, commonly referred to as polio, is an incurable acute viral infection. If the virus enters the central nervous system, it can cause muscle weakness and flaccid paralysis to affected muscle groups. Spinal polio is most common, and often directly affects muscle groups in the feet and legs. The damage to the nervous system from polio can range from a slight loss of mobility to permanent paralysis of the thigh muscles. Physiotherapy combined with treatment with an orthosis can help the person affected to regain the greatest possible mobility and independence following acute illness. Ankle-foot orthosis (AFO) braces attach just below the knee and keep week ankles from rolling. Knee-ankle-foot orthosis (KAFO) braces are full leg braces that fit around the top of the leg to stabilize knee muscles. Hip-knee-ankle-foot orthosis (HKAFO) braces add an additional corrective belt around the hips to force correct alignment of the legs. Do you suffer from intense heel or arch pain? It could be Plantar Fasciitis. Plantar fasciitis is a very painful injury, and the most common cause of heel pain. The plantar fascia is a thick band of tissue that runs along the bottom surface of the foot connecting the heel bone to the ball of the foot. Excessive stretching of the tissue while running or walking can cause tiny tears that lead to irritation, inflammation and pain on the bottom of the heel, the arch of the foot or both locations. If left untreated, plantar fasciitis can cause other conditions like heel spurs. Our heel bone is the largest bone in the foot and absorbs the most amount of shock and pressure. Plantar fasciitis is most painful with your first steps in the morning or after a long rest because the plantar fascia contracts and becomes less flexible while you are off your feet. Just like muscle tissue, the plantar fascia contracts and becomes less flexible when it is cold and inactive. The pain may decrease as the day progresses and the plantar fascia is stretched and warmed up with use. However, the pain may return after long periods of standing, walking or running. This is especially common if you are wearing shoes with inadequate arch support. Pain with first steps in the morning or after long periods of rest. Over-pronation, or excessive rolling inward of the foot while walking, is the most common cause of plantar fasciitis. A foot with an excessively high arch. Pes cavus occurs in up to 15% of the population, of which 60% will develop foot pain. Common complaints associated with pes cavus include pain under the metatarsal heads and the heel, lateral ankle sprains, and footwear issues. Custom orthoses should be designed to address the pathomechanics of problematic cavus foot based on the evidence in the literature. Increase plantar surface contact area.The overload on the metatarsal heads is a result of limited plantar surface contact due to the high arch and limited ankle joint dorsiflexion. Increasing plantar surface contact with an orthosis ensures that more of the foot is bearing weight in the arch and the metatarsal heads are bearing less weight for less time. Resist excessive supination. Lateral ankle instability and a laterally deviated subtalar joint axis (STJ) are frequently associated with high arched feet. This lateral position of the STJ axis results in excessive supinatory torque around the subtalar joint axis. The prescribed orthosis should be designed to resist this excessive supination. Resist both excessive pronation and supination forces. Rearfoot instability is an extension of the laterally deviated subtalar axis. However, in flexible pes cavus feet, midtarsal flexibility complicates the later portion of the stance phase of gait. The forefoot pathology produces midtarsal joint supination that leads to excessive pronation of the rearfoot. Some pes cavus feet suffer from both lateral ankle instability at midstance and rearfoot pronation at late midstance. It is essential that the prescribed orthoses is designed to provide resistance to both excessive pronation and supination forces. Rehabilitation includes all measures aimed at reducing the impact of disabling and handicapping conditions and enabling the disabled and handicapped to achieve “Social Integration”. This aim can never be achieved if different professionals work in isolation. So it is of paramount important that all professionals responsible for the rehabilitation of disables, work in close collaboration as a “Team”. 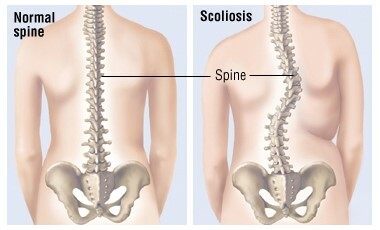 Scoliosis is abnormal side-to-side curvature of the spine. The spinal curve may develop as a single curve (shaped like the letter C) or as two curves (shaped like the letter S). In children and teens, scoliosis often does not have any noticeable symptoms and may not be noticeable until it has progressed significantly. The two most common forms are degenerative and idiopathic scoliosis (adolescent). Adolescent Idiopathic Scoliosis (AIS) affects children during adolescent growth periods. The cause is unknown, hence it is called idiopathic. It is usually painless and affects both boys and girls. Girls tend to be associated more with AIS as it progresses to need treatment, either a scoliosis brace or surgery, more frequently in girls. Three orthopedically approved options exist for combating scoliosis: observation, bracing, or surgery. A scoliosis curve usually does not improve without surgery. However, studies have shown that wearing a scoliosis brace as prescribed can often prevent the progression of scoliosis. As such, wearing a brace can be an effective way to keep a scoliosis curve’s Cobb angle relatively small and manageable. A scoliosis curve that is 50 degrees by the time an adolescent reaches skeletal maturity (about age 14 or 15 for girls and 16 or 17 for boys) will continue to progress throughout adulthood. These types of curves are likely to become a severe deformity that requires surgery. Therefore, the goal of bracing is to avoid a major surgery by either stopping curve progression altogether or at least preventing it from reaching 40 or 50 degrees at the time of skeletal maturity. Bracing treatment aims to apply corrective forces on the spine to release load on the concave (inner) part of the curve and increase load on the convex (outer) part of the curve. The idea is that a bone experiencing compression will grow less and a bone experiencing distraction (less or no compression) may grow more. Bracing tries to slow down the scoliosis curve’s bone growth on the side that needs to be slowed, and speed up growth on the side that needs to speed up. While bracing will not typically reverse or correct with bracing, it can slow or reduce any progression of the curve until the child reaches skeletal maturity. After this point, the bones are unlikely to so the curve is unlikely to progress (provided it is less than 40 degrees). The exact mechanisms of bracing are still being studied. However, literature indicates that the brace needs to be rigid (hard) in order to apply strong and consistent pressure on the scoliosis curve to have an effect. Hope provides custom made Scoliosis brace which are made of special plastic to apply strong consistent pressure against the lateral curve. Make sure that the residual limb is in the correct position. This helps to prevent muscle tightening, which would ultimately prevent a full range of motion upon healing. Avoid spending a lot of time with the arm or leg hanging down. A newly amputated limb should be kept lifted high up most of the time. With the help of rehabilitation exercises, the muscles in your residual limb can remain limber. Doing those exercises will help prevent contracture, which is the shortening and tightening of the residual muscles. Shortly after the amputation site has healed, the skin in that area will be very sensitive to touch. For some, this sensation can even be painful. Desensitization of the area can help to keep those issues to a minimum. Rubbing the area, and gently touching it can help to desensitize the skin. Over time, as the amputation site begins to desensitize, increased pressure can help prepare you for prosthesis fitting. Once the wound has healed, the limb is most likely still going to be swollen. To reduce swelling, and be sure that it will fit into the socket of a prosthesis (or prosthetic limb), it must be “shaped” with the use of compression bandage or shrinker sock. The shrinker sock, also known as a compression stocking, is a tapered sock that will apply pressure evenly to the bottom of the residual limb, helping to reduce swelling. The sock should be worn as often as possible. Preventing infection and skin problems can easily be done with daily hygiene for the residual limb. Wash it at least once a day, and scrub it gently with a washcloth, mild antibacterial soap, and warm water. Be sure that the limb is dried completely, this will help keep moisture from being trapped beneath the shrinker sock. Each day, wear a clean shrinker sock. These socks can be washed with mild soap and warm water, rinsed, and air dried. At some point after your surgery, your healthcare providers will discuss several things with you including the use of shrinkers, desensitization, positioning, contracture prevention, exercise, phantom sensation and phantom pain. 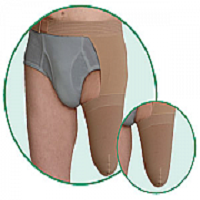 To manage post-operative edema, you may be prescribed a shrinker as a means of compression therapy. Shrinkers are elastic garments that are simply pulled on or wrapped around the limb. They are typically used when the suture line is reasonably healed. Both methods help to expel excess fluid that remains inside the limb. This helps to prepare you to wear a prosthesis by providing an appropriate limb shape. Studies have found that shrinker socks are more effective than elastic bandages when it comes to reducing the volume of a residual limb. A shrinker sock is worn continuously unless the prosthesis (or prosthetic limb) is on, or the patient is bathing. Tennis elbow is caused by a strain to tendons in the forearm. The tendons become inflamed where they join the bony part on the outside of your elbow joint. Any activity that involves gripping and twisting of the forearm can cause this type of strain – most cases aren’t actually related to tennis or any kind of exercise. Golfer’s elbow is a similar condition that affects the inside of the elbow joint near the funny bone. Symptoms vary – you may have mild discomfort when you move your arm, or the pain may be bad enough to disturb your sleep. The outside of your elbow will feel tender to the touch and there may be swelling. You may also have pain further down your forearm. Repetitive movements of the wrist will make the pain worse, especially if combined with a weight, for example if you’re lifting boxes. Simple self-help treatments are probably all you’ll need to clear up your tennis elbow. Most cases will ease within about 2 weeks and you probably won’t need to see a doctor. The first thing you can do to help is to adapt any movements that may be causing your symptoms. For example, lift objects with your palms facing upwards and elbows bent. Painkillers such as paracetamol and ibuprofen may help and you should use them if you need to. It’s important that you take them regularly and at the recommended dose to help you control the pain and allow you to continue exercising. Don’t wait until your pain is severe before taking painkillers. You can also rub anti-inflammatory cream directly onto the painful area. You shouldn’t take ibuprofen or aspirin if you’re pregnant or have asthma, indigestion or an ulcer until you’ve spoken to your doctor. If the pain hasn’t eased over 2–4 weeks you should see your doctor. Your doctor may suggest a steroid injection into the painful area. One injection is probably all you’ll need, though you may still need to rest your elbow for 2–3 weeks afterwards. There’s a slight possibility that the pain will become worse for a few hours after the injection, occasionally lasting for up to 48 hours. If your elbow pain is affecting your activity and is persisting you need physiotherapy. Physiotherapy can help you to manage pain and improve your strength and flexibility. A physiotherapist can provide a variety of treatments, help you understand your problem and get you back to your normal activities. 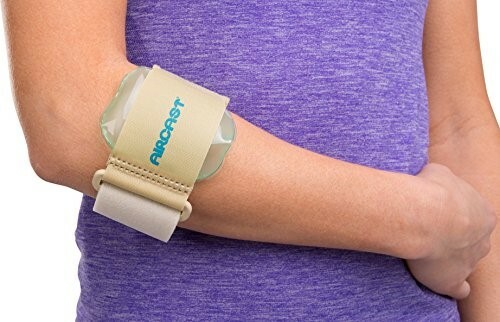 Tennis Elbow Brace can be very effective in reducing the strain on your elbow if you need to make repetitive hand and elbow movements, for example while you’re working. Walker boots are designed to aid in foot and ankle stability and limit range of motion of the lower extremity. Walker boots are designed with a solid or articulating ankle joint to accommodate for the treatment of injuries, fractures, chronic conditions or disease. Each orthosis has a removable inner lining to protect the skin from breakdown, malleolar (ankle) pads for additional stability and comfort, and a rocker bottom sole to provide smooth walking pattern.